When Pastor Tim Klinkenberg, pictured in the balcony of St. John’s Lutheran Church, isn’t motivating his congregation at services, he enjoys sunrise bike rides at Santiago Oaks Regional Park. When Reverend Tim Klinkenberg attended his brother’s wedding, he didn’t expect a job offer. Twenty years later, Klinkenberg continues to serve as Senior Pastor of St. John’s Lutheran Church of Orange. 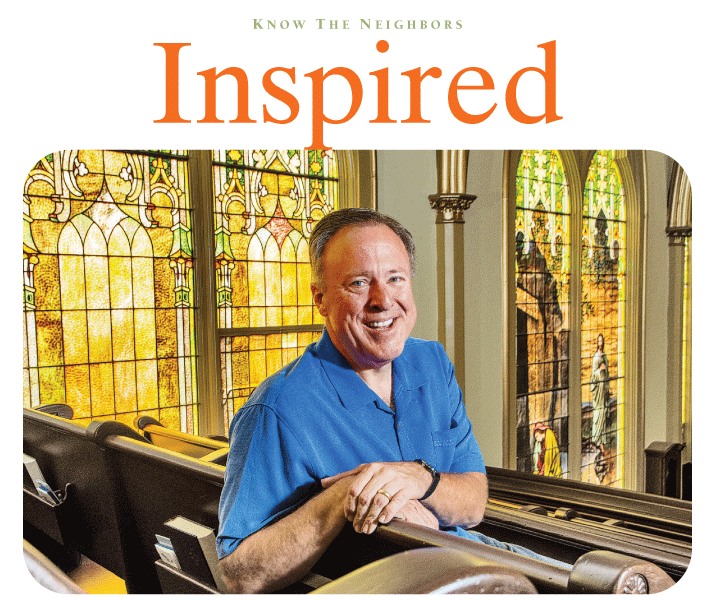 For the last two decades, Klinkenberg has found it inspiring to oversee the 4,500-member church in the heart of Old Towne, which dates back to 1882. “There’s a powerful feeling of kindness and generosity at St. John’s,” says Klinkenberg of the congregation that does its best to help members in need, as well as the community. Every fourth Saturday, the church works with Second Harvest Food Bank of Orange County to serve about 125 underprivileged families. Klinkenberg and the church strongly emphasize helping children in need. Each year, the congregation participates in Operation Christmas Child, an initiative that encourages members to collect items for donation, including socks, pencils and more. Last year, St. John’s compiled around 1,500 boxes for children in Africa. St. John’s has both a preschool and a K-8 school that teaches children of members and the surrounding community. The school recently opened a STEM (science, technology, engineering and math) laboratory. Klinkenberg strives to create a compassionate environment and to make everyone feel at home, no matter the circumstance. He recalls the evening of September 11, 2001 and how church members leaned on each other as sources of strength. Klinkenberg’s goal for St. John’s is to be known as a healing, welcoming presence in the community. “When people are hurting or confused, we’re ready to welcome them and show them they’re not alone,” he says.